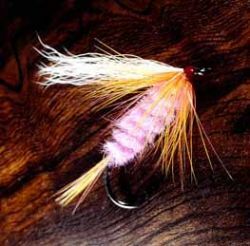 The Borden Special is a fly developed by Bob Borden for sea-run cutthroat. The sea-run cutthroat trout is a marvelous fly-rod fish well-known to anglers in the Pacific Northwest but little-known elsewhere. That seems strange since the steelhead—another Pacific trout that runs to saltwater—is familiar to fly fishers in Colorado, Saskatchewan, Texas, Kansas, and most anywhere in North America, regardless of how far these places may be from the steelhead's domain. Perhaps the sea-run cutthroat's reputation remains small because the fish itself is small when compared with the steelhead and all the Pacific salmons. Perhaps it is because the sea-run is so unpredictable that only a relatively small number of fly fishers seriously seek him. In any case, what really matters here is that the sea-run cutthroat is worth seeking, and that it is often caught on Bob Borden's wet-fly. It's a fine fly for sea-runs(as they are often called). It follows the traditional wet-fly styling so well-established for sea-runs, and its body is pink—a color which I believe sea-runs love—with a bright tinsel rib to make it conspicuous. Fish it in rivers in the slow water sea-runs prefer, late summer to fall. Swim it steadily just under the surface, and if you are lucky enough to find them, the sea-runs will almost certainly take your fly. To learn how to tie this popular fly, go to the link below to part 2 of this article, the B. Special, Tying Steps.